Home>Quality commitments> P.D.O. and A.O.C. The “Appellation d’Origine Contrôlée” (A.O.C.) of the Vallée des Baux de Provence has existed since 1997. It spans 1,700 hectares to the north-east of the Bouches du Rhône, in the very heart of the Alpilles chain, a limestone massif rising 400 metres in altitude and stretching some 30 kilometres between Arles and Salon de Provence. A choice land for the olive tree, an exceptional region, with a dry and hot climate, limestone soils, and varied geological layers between the Alpilles chain and Crau. The Appellation d’Origine Protégée (A.O.P.) [Protected Designation of Origin (P.D.O.)] is the European equivalent of the “Appellation d’Origine Contrôlée” (A.O.C.) [registered designation of origin]: It meets the same requirements and makes it possible to recognise products throughout the European Union. 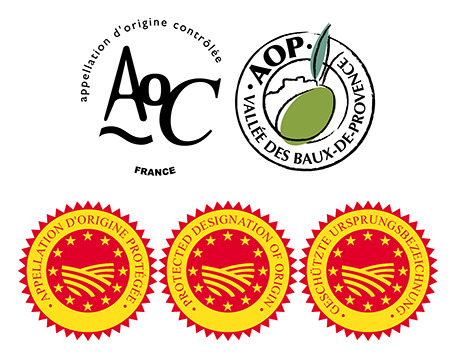 French products must at this time obtain the “Appellation d’Origine Contrôlée” before they are recognised under “Appellation d’Origine Protégée”. For the sake of harmonisation and better consumer information, all registered designations of origin already recognised as protected designations of origin have, since 1 May 2009 borne the P.D.O. initials or the P.D.O. logo. P.D.O. guarantees traditional know-how, a unique region and authenticity of the products for the consumer.